Mass Animal Deaths: Nature, Nurture, Conspiracy, or Apocalyspe? 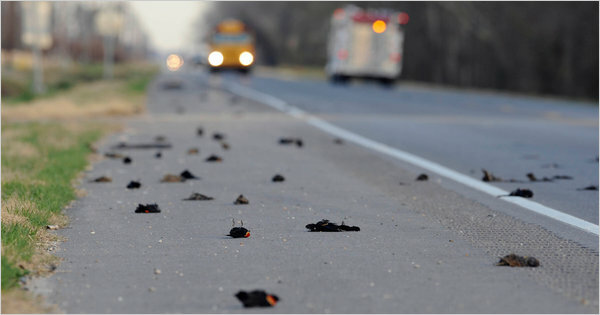 The Red-winged Blackbird deaths on New Year’s Eve 2011 sparked an international debate over trends in mass animal deaths around the globe. That night, 5,000 birds plummeted to their demise over the Beebe, Arkansas, with low-flying and fireworks cited as the cause. One report assumed the birds just began “colliding with things” due to poor eyesight. But this event alone did not coax the controversy; just two days earlier over 100,000 fish were found floating in the Arkansas River a mere miles from Beebe, and three days after the barrage of blackbirds, 500 more birds of mixed breeds fell from the sky in Louisiana. Reasons provided ranged from disease to power line exposure. Here in the Northern Rockies, it’s all wolf, all the time. But larger implications loom for all imperiled species. “Wolves at a Crossroads: 2011 – The Endangered Species Act in Peril” is a comprehensive document on wolves and the concurrent threat to the integrity of the ESA. Congressional interference stands to weaken the Endangered Species Act, endangering critical protection that has served our nation well for more than 37 years. Next to bald eagles, the recovery of wolves in the American West has the potential to be one of the most celebrated success stories of the ESA and another great stride in preserving our natural heritage. Or, conversely, by allowing legislation to mandate the removal of ESA protections for wolves, our nation stands to set a dangerous new precedent for all endangered species and environmental stewardship. If wolves can be removed from federal protection by willful misrepresentation of scientific fact, what species will be next? This report was prepared for and delivered to members of Congress by representatives of Living With Wolves, founded by filmmakers Jim and Jamie Dutcher. 2011 NEW YORK STATE BAR ASSOCIATION COMMITTEE ON ANIMALS, LAW STUDENT WRITING COMPETITION. Get the full 411 here. "Hand over the berries, sis." 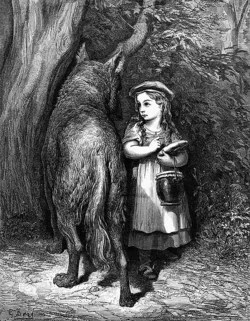 Purple prose…melodrama…not what you expect to find in legislation these days UNLESS it comes from the Northern Rockies and deals with “imported Canadian wolves.” To wit: Idaho’s House Bill 343, introduced to the House for its first reading on 4/4. 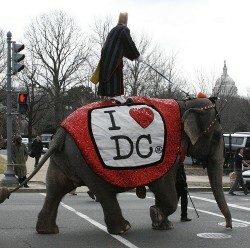 This prompts one to ask, Does America care less about animals than other countries?